Heel impact, heat transfer, bio-mechanical pathways. Spend too long in the company of an expert on the pros and cons of running shoes and you would be forgiven for thinking there was a lot more to the sport than simply putting one foot in front of the other. But the appliance of science does have its uses, principally in providing protection from the physical battering the lower body takes during exercise. Ok, so modern technology means that your feet will never have had it so good. But which ones to buy? The choice really is bewildering. There are swooshes and stripes, all manner of colour combinations, even some that can be hooked up to your computer to provide the latest performance-related information. If you are starting out, you are looking for a shoe that is going to protect you from the rigours of running on hard surfaces but will be equally suited to using in the gym. This means that for now we can forget about issues such as extra traction and reinforced soles that would apply if you were interested in trail or cross-country running. Every one’s foot is different. The same is true for their body and how their posture impacts on the way that their foot falls with each step. All these elements must be taken into account when choosing the correct shoe. And that is why it is always advisable to find a specialist running shop or even one of the bigger stores where staff are aware of these considerations.It is simply not a case of finding a shoe that “fits”. That should be a given. It’s how they will interact with you once you are on the move. For example, do you have a tendency to put more weight on the outer edge of your foot, or on the front part of your foot rather than the rear? 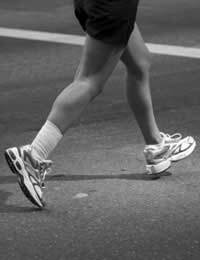 The trained eye should look at the way you run and your posture, and be able to advise on the best pair for you. Weight should be a consideration, too, because the heavier you are, the more efficient the shoe will need to be in terms of shock absorption in order to prevent the ankles and knees taking a battering. In short, it’s about how the shoes perform during motion, the stability that they afford and the cushioning that they offer. Once all these factors have been taken into account, then the right shoe can be quickly identified. If this process results in a shoe that costs a little more than you were hoping to pay, then if possible bite the financial bullet and take the resulting hit in the wallet. No single piece of equipment is more important to your running than what is on your feet. Cut corners and the chances are you will pay the penalty. If you can’t afford the right shoes, it is better to wait until your savings account reaches the magic number and then buy them, rather than settling for an inferior pair that may get you on the road quicker but will leave you nursing an injury that will curtail any running for a significant period.